for a late breakfast and bracing cappuccino. The temperature in the valley already was in the 80s, under a cloudless, azure sky. 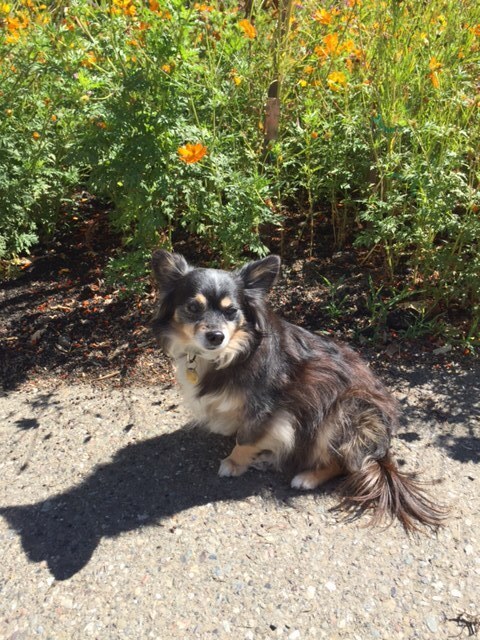 While I was eating Gus checked out the flowers. Jess bought years ago, for which we’re currently trying to establish an A.V.A., since it makes no sense to say that mountain wines come from a valley appellation. 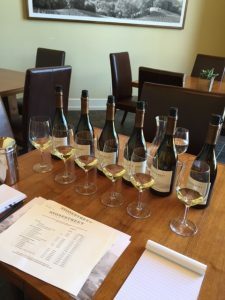 The family long has called it Alexander Mountain Estate, and it was the Cabernet Sauvignons and Chardonnays off this sprawling, beautiful property I had come to taste. The first flight was white; the second, red. 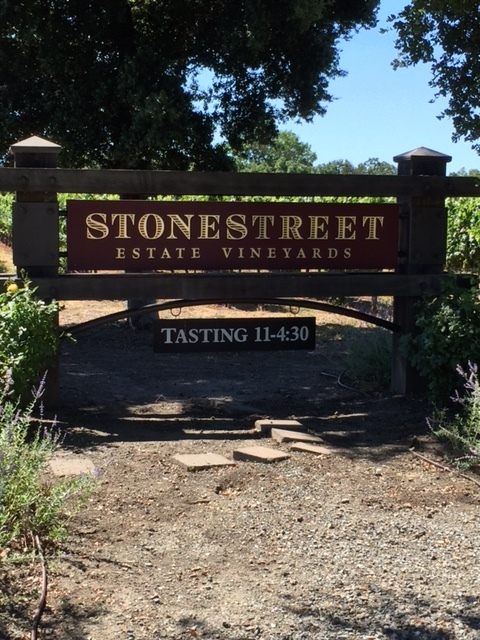 All the wines are Stonestreet. Here are my abbreviated notes. There was no need to taste blind. 2013 Broken Road. Rich golden color. Complex aromas of wet stone, tropical fruit, white peach, crème brulée, baking spices. Rich and delicious, with bracing acidity and a creamy texture. Score: 95. 2013 Upper Barn Vineyard. Rich golden color. Similar to Broken Road, but more saline and minerals. Ripe white peaches, tropical fruits, buttered toast, crème brulée, vanilla bean. Insanely rich, with bracing acidity. Notable for its superior structure. Score: 96. This is the white wine I brought home with me. 2013 Gravel Bench Vineyard. Rich golden color. The oak is more apparent (it’s the only Chard aged in 100% new French oak). A big, exuberant wine, with tropical fruit, nectarine and white peach fruit. On airing the oak got more integrated. Score: 92. 2013 Gold Run Vineyard. Rich golden color. Nice, firm flintiness, but the fruit and oak star. Tiers of golden mango, crème brulée, lemon meringue, vanilla bean, honey custard. Excellent acidity. A real star. Score: 95. 2013 Bear Point Vineyard. Good golden color. Nose a bit shy, suggesting lemon verbena, honey, golden mango, white peach, vanilla bean, buttered toast. Really rich and wonderful, in a way my favorite for its exquisite tension of parts. Score: 97. 2013 Cougar Ridge Vineyard. Good golden color. A tangy green apple note brings a bite to the mango, grilled pineapple and crème brulée richness. Lots of oak in the mouth: vanilla bean, buttered toast, smoke. Soft, creamy and opulent. Score: 94. 2012 Bear Point Vineyard. Pitch black color at the center, garnet at the rim. Very young and closed now. Jammy plums, tar, coffee and smoke. Thick tannins, bracing acidity. Dense and concentrated. Needs plenty of time. After 2020. Score: 94. 2010 Rockfall. Similar color to Bear Point. At six years, still closed, mute, resistant at first. On airing, hints of dark chocolate, olive tapenade, plums, black currants. Very tannic. Great structure, lots going on down underneath the astringency: creosote, blackberry jam, black licorice, cedar, toast, mushu plum sauce. Reminds me of Lynch-Bages. Needs time. After 2020. Score: 95. 2012 Rockfall. Midnight black without a moon, turning purple at the rim: young, young, young. Hints of blackberry jam, sweet oak, cocoa, rum, plums. Great primary fruit sweetness, plump, fat, rich, but very tannic. Good acidity, elegant structure, great weight and balance, with a very long, spicy finish. 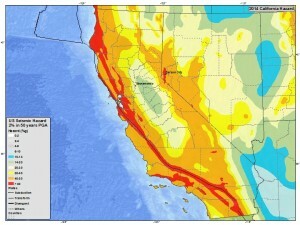 Superior if possible to the 2010. Needs time. After 2020. Score: 96. 2011 Christopher’s. The highest point on the mountain, at over 2,400 feet. The blackest color of all, impenetrable. Tight, closed; airing shows blackberry jam, clove, mint (eucalyptus), dust, smoke. Extremely complex but very tannic. Massive core of ripe summer blackberries and cassis; creosote, minerals. Needs lots of time. Drink after 2020. Score: 96. This is the bottle I brought home with me. 2012 Legacy. Another dark black wine with glints of ruby and garnet at the rim. The 30% Merlot in the blend is immediately apparent, giving a floral-violet scent to Cabernet’s blackberries and plums. In the mouth, complex, smooth, more forward than the other Cabs, but still very tannic, with blackberry, cherry, shaved chocolate, anise and baking spice flavors. You could drink it now but it will age for decades. Score: 94. 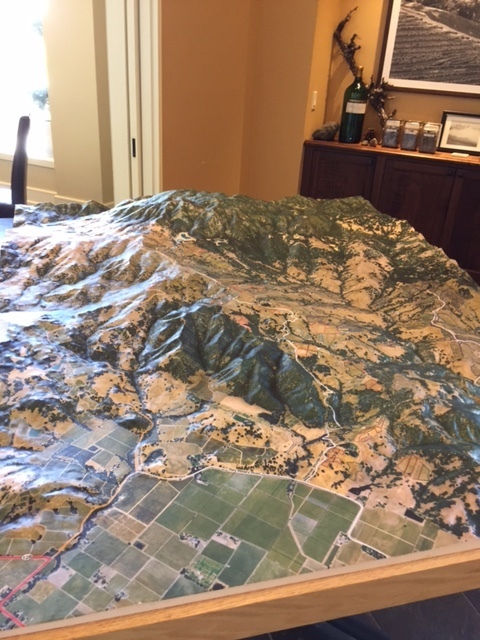 Why does the Alexander Valley AVA include the mountains? It makes no sense. A “mountain” is not a “valley,” and vice versa. And yet, the Alexander Valley was given AVA status by the federal government in 1984 despite the soaring Mayacamas range that forms its eastern wall. Even back when I was researching my first book, A Wine Journey along the Russian River, I concluded that the mountains deserved their own appellation. After all, just on the other side of the Mayacamas, the Napans had done a pretty good job of sub-appellating their peaks: Veeder, Spring and Diamond. Why, then, was the same mountain range, except on its other slope, not sub-appellated, but spooned into the nonsensical moniker of a “valley”? When you get to 500 feet, 1,000 feet, 1,500 feet or more above the floor of the valley, you’re obviously dealing with very different terroirs. The temperature during the day is lower because, along California’s coast, you lose a degree or so with every hundred feet of altitude. During the nighttime, the temperature is generally higher at a higher altitude because of the well-known phenomenon of temperature inversion. The peaks also are usually above the fogline, which makes the solar patterns entirely different from down on the floor. The soils way up high are sparse and infertile, compared to rich alluvial dirt down below. Even the flora is distinct. 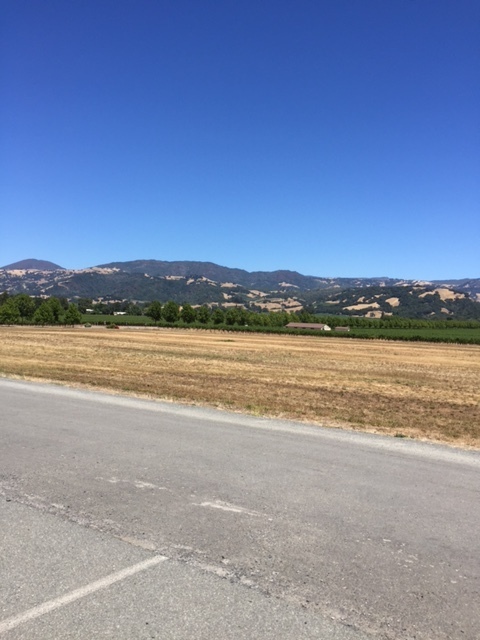 Clearly, there should be a new AVA, or perhaps several, for the high Mayacamas peaks east of Geyserville and Cloverdale. I doubt that the TTB, or the old ATF of the Treasury Department, would approve an Alexander Valley AVA today, as currently bounded. That department has evolved over the years in intelligent ways; they’ve become more discriminating in what they look for in an AVA. This is a good thing, but it naturally implies that, at least here in California, we need to take a second look at some of our more antiquarian appellations. You know I’ve long argued that Russian River Valley is in serious need of sub-appellating. I feel the same way about Santa Rita Hills. Maybe it’s even time to split Anderson Valley into Boonville, Philo and Navarro, since the Deep End is quite different from inland. But of all the miscalculated AVAs in California, none is in need of alteration as much as Alexander Valley. While I am affiliated with Jackson Family Wines, the postings on this site are my own and do not necessarily represent the postings, strategies or opinions of Jackson Family Wines. It comes as no surprise to me that Napa County is the seventh least affordable housing market in the country. We know that places like San Francisco, Marin and Manhattan are unaffordable to all except the wealthiest of our citizens, but Napa? True, it’s never exactly been Motel 6 country, but in Napa City you didn’t used to need millions of dollars to afford a fixer-upper. Now you do. The media price of a home in Napa just it $545,000, about one-half that of a house in San Francisco, but 2-1/2 times more than the average price of a U.S. home. The reasons why are not hard to discern: Napa Valley, like all of California’s valleys, is visually beautiful. The weather is outstanding. San Francisco is only an hour away (depending on traffic). Ski country to the east, the Pacific to the west, lakes, mountains and wilderness all around, what more could you ask for? Throw in the glamor of wine, and the cost of entry suddenly shoots sky-high. It wasn’t that long ago that Napa City was a dumpy place. The upper classes didn’t live there, or even visit; they went to St. Helena, or Calistoga, or the south valley to dine, or drove into the Bay Area. But in the 1990s and early 2000s the city began all that work along the riverfront. Hotels and posh resorts went in, along with expensive restaurants, and voila, Napa City became chic. And now, the French are invading Napa Valley: S.F. Eater reports that, “From Mount Veeder to Calistoga, Napa estates are selling fast to Bordelais vintners.” In other words, when it comes to real estate prices, you ain’t seen nothing yet. Funky $ebastopol! Where is the pot and patchouli crowd going to live? Maybe Guerneville, where the median home price is a comparative bargain, at $366,100. Now consider Cloverdale. 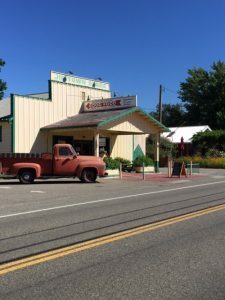 If you know it, it’s as the one-stoplight town, at the crossroads of Highway 101 and Route 128, in the center of the Alexander Valley. Entrepreneurs have tried for years to gussy up Cloverdale, but the farm town firmly resisted their efforts, remaining stubbornly rural and slightly shabby. As a homeowner myself, I am benefitting from this stupendous rise in coastal California real estate values. My city, Oakland, is “poised to be the Bay Area’s hottest [housing] market in 2016,” says the San Francisco Chronicle. Still, I worry about the people who can’t afford to live here, or anywhere else along the coast. From San Diego and La Jolla up through Big Sur, Silicon Valley, San Francisco and northward into wine country, California is becoming a Disneyland for the privileged classes. I don’t know the answer, any more than anyone else. 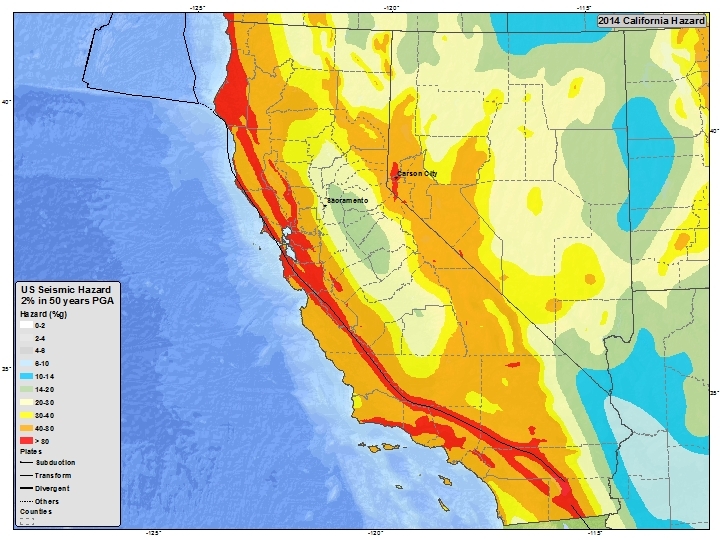 This trend may be unstoppable, except for one force stronger even than the market force of supply and demand: the San Andreas Fault. It was back in 2009 that I gave the 2006 La Joie a near-perfect 98 points. A year later I gave the 2007 Verite La Muse 100 points. So you could say these wines, produced by Pierre Seillan, delight and amaze me and rise to my highest expectations of what California-Bordeaux can and should be. Our tasting was entirely blind. The other wines and their scores were Matanzas Creek 2011 Journey * (96 points), Rodney Strong 2012 Rockaway Cabernet Sauvignon (88 points), Hall 2012 T Bar T Ranch Cabernet Sauvignon (90 points), Hidden Ridge 2012 Impassable Mountain Reserve 55% Slope Cabernet Sauvignon (91 points), Lancaster 2012 Nicole’s Red Wine (91 points), Arrowood 2012 Reserve Speciale Cabernet Sauvignon * (92 points), Stonestreet 2012 Legacy Red Wine * (98 points), Stonestreet 2011 Christopher’s Cabernet Sauvignon * (88 points), Silver Oak 2011 Cabernet Sauvignon (92 points), Cenyth 2010 Red Wine * (93 points), Anakota 2012 Helena Montana Vineyard Cabernet Sauvignon * (93 points) and Kendall-Jackson 2012 Jackson Estate Hawkeye Mountain Cabernet Sauvignon * (93 points). The vintages all were either current releases or the most current releases I was able to obtain buying direct from the wineries. I should add that I also was pleased that one of my fellow tasters, Chris Jackson, also scored the Verite ’12 La Joie a perfect 100 points. When the paper bags came off, it was high-five time. As some of my readers know who followed my career, I never gave very many 100 point scores, but one was that ’07 La Muse. These Verités are extraordinary wines. They are of course blends from mountain vineyards throughout Sonoma County; it was those wines, in part, that led me to understand that a California-Bordeaux does not have to be sourced from a single vineyard in order to attain perfection. In fact, quite the opposite can be argued: That having your choice of multiple pedigreed vineyards, rather than having to source from only one, allows the winemaker to fill in the divots in order to produce a more complete, wholesome wine. Of course, this implies a very high level of skill on the part of the blender! Nor would I concede that such a blended wine doesn’t display terroir. (Another blend I gave 100 points to was the 2006 Cardinale, made from grapes grown in Mt. Veeder, Howell Mountain, Stags Leap and Oakville.) I do think a great Pinot Noir should probably come from a single piece of dirt, but even here I could be wrong. It often is said that the difference between Sonoma-grown Bordeaux wines and Napa Valley Bordeaux wines is that the former are earthier and more “French.” I think that is largely true; the tannins are firmer and there is slightly more herbaceousness in the form of sweet dried herbs and often a floral character reminiscent of violets. 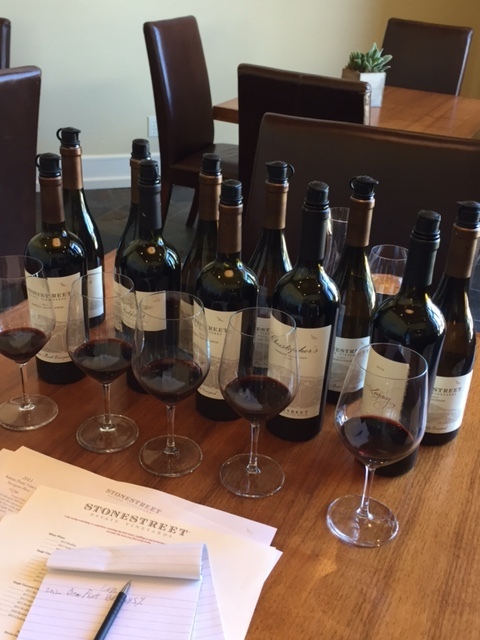 Most of the wines in yesterday’s tasting were grown on the western slope of the Mayacamas, not far from places like Spring Mountain and Diamond Mountain, in fact just on the other side of the ridge. 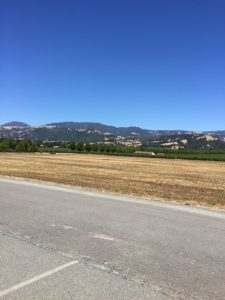 But Napa Valley is one mountain range further inland and so is that much warmer and drier; the resulting wines tend to be lusher, more opulent, and higher in alcohol. But I would not want to over-emphasize those distinctions. Suffice it to say that some of these Sonoma Cabs, especially from the west side of the Mayacamas, are stunning and ageworthy. I don’t hesitate to praise the Jackson Family wines just because I work there; in fact it makes me very happy to see them do so well. As I said, the tasting was absolutely blind. Nobody had any idea what the wines were, although that didn’t stop us from guessing. I was troubled by the relatively modest score of the ’11 Stonestreet Christopher’s, a wine I’ve always liked (I gave the ’06 and ’07 both 96 points, for example), but as you know 2011 was “the year summer never came,” and this wine, grown at 2,400 feet on the winery’s Alexander Mountain Estate, is exquisitely sensitive to vintage conditions. I think the fruit, in that brutal environment of 2011, just didn’t get ripe enough (although it’s only fair to add that Wine Advocate gave that wine 94 points. So maybe I just didn’t “get it”). Anyhow, bravo to Sonoma County for doing so well. I think for our next tasting we’ll do Jackson Family’s Napa Valley Cab/Bordeaux blends against some of the top-rated wines in the valley. That will be interesting, if expensive, and I’ll report on the results right here! You all know that I work for Jackson Family Wines. I have so say that upfront, because of what I’m about to write, which is how good and fine a place Sonoma County is for growing Cabernet Sauvignon and Bordeaux varieties in general. If I were still the California wine critic for Wine Enthusiast magazine and I made that statement, I think people would take it at face value. They might or might not agree, but at least they’d believe that it was my own opinion, unbiased and uninfluenced by personal or venal considerations. When you work for a winery, though, and you make a statement in praise of their wines and vineyards, people tend to be skeptical. And that’s entirely understandable. Having been on the receiving end of press releases and hype from P.R. types for decades, I would be skeptical, too, if I were you, to hear me say how great Sonoma Cab can be. I accept that risk and that criticism. But I’m going to say it anyway. 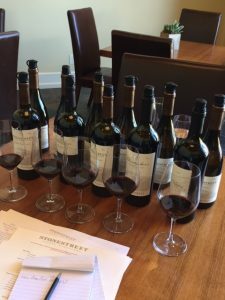 What brought this thought process to my mind was this article, from the drinks business, that describes how Verité, a Jackson Family Wines winery in Sonoma County, was the favorite wine in a recent tasting of “50 of London’s leading sommeliers.” The tasting included the esteemed Napa properties, Harlan Estate, Screaming Eagle and Scarecrow. My friend Julia Jackson, the daughter of Barbara Banke and the late Jess Jackson, told the drinks business, accurately, “that it’s not necessarily the right decision to go to Napa for cult Cabernet,” and that Sonoma is in “its infancy” when it comes to Cabernet and Bordeaux blends. 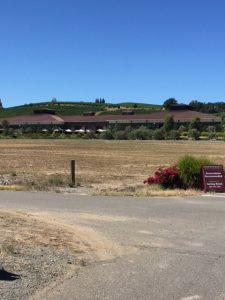 Julia alluded to another point, that Napa Valley has achieved its greater fame for Cabernet, even though the history of winemaking in Sonoma is older, because Sonoma doesn’t “have the same marketing resources as Napa.” That is undeniably true. The campaign waged by Napa Valley wineries over the last 40 years, to promote in particular Cabernet Sauvignon, has been relentless, well-financed and highly successful. This obviously is not to say that Sonoma makes better Cabernet and Bordeaux blends than Napa Valley, or the other way around. It might actually be more accurate to say that northern California has a superb Cabernet zone that sweeps from the west-facing ridges of the Vaca Mountains, across Napa Valley, up and onto the east-facing slopes of the Mayacamas, then extends to the west-facing slopes of the Mayacamas and its associated foothills, which are largely situated in the A.V.A. of Alexander Valley. The political lines of counties were not designed by nature, and are irrelevant from the point of view of terroir. He defines that as “circus acts, jazz concerts, drive-in movies and very expensive wine/food pairing meals on winery grounds…designed to attract tourist dollars.” His point is that this “extravagant marketing” is responsible, to a large degree, for the tourism and associated congestion that many Napa residents (and those in other wine regions) have been complaining about. 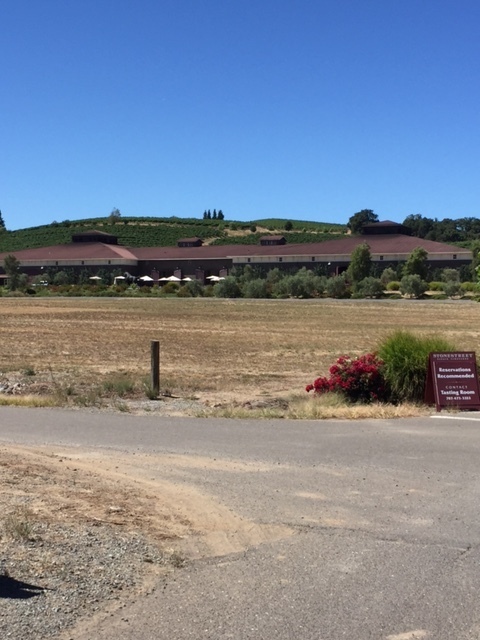 Without getting into that thicket, it is reasonable to assert that the investment Napa vintners have made in these “extravagant events” has been responsible, to a large degree, for the worldwide fame Napa has achieved. I’m not putting Napa down for that, or suggesting that it’s in any way improper. Vintners have promoted their wines, and tied them to glamor, since time immemorial; it’s not like the Napans invented marketing! But we do seem to be living at a time when old stereotypes are being discarded, and one of them, it seems to me—an important one—is that Napa Valley is the go-to place for high-end Bordeaux-style red wines in California. Not true. Alexander Valley, Knights Valley, Chalk Hill, sometimes Dry Creek Valley and Sonoma Valley—they all have their share of wonderful Cabs, usually at a fraction of the price of Napa. I hope that the Millennial bloggers and critics, who say they are entirely willing to topple old clichés, will recognize this truth, and write about it.